When corn prices drop in Iowa, or when excess corn sits in grain bins in South Dakota, it doesn’t just affect America’s farmers and the Midwest economy. The market conditions in the Midwest can, say, affect the price of commodities in Brazil, or change the quality of steak in China, or threaten the livelihood of a farmer in Kenya. Today, the current conditions of the U.S. ag economy — fluctuating commodity prices, declining profits, ever-rising corn yields and the excess it creates — has the global ag market on edge. American farmers are sitting on record amounts of corn. The United States Department of Agriculture (USDA) reported the 2017-18 market year opened with 2.35 billion bushels of corn carryout, or “ending stocks,” the amount left over after the immediate need for a grain has been met. That’s the most in nearly 30 years. The export of corn itself would seem to be the easy answer. To those in the know, it’s not. Over the last few decades, corn exports have remained relatively flat — an average of roughly 1.9 billion bushels per year — as yields continue to grow. In 2016, U.S. farmers produced 2.7 billion more bushels of corn than in 2010. 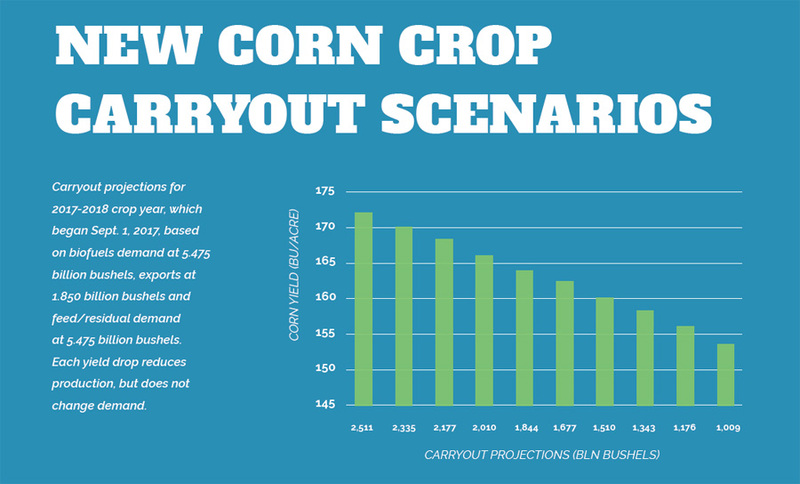 Demand for American corn may not be growing, but competition is. Argentina exported $4.2 billion worth of corn and Brazil exported $3.7 billion during 2016 — a combined total of 27.5 percent of total corn exports. The fastest growing corn exporters by dollar value over the past several years include Mexico (up 104 percent since 2012) and Russia (up nearly 50 percent since 2012). Kip Tom’s answer — and the answer of many industry experts — comes in the form of biofuels. “Increasing biofuels in our fuel supply will be critical as yields continue to rise to stabilize commodity supplies and prices. This allows farmers in the U.S. and developing nations to turn a profit, feed their families and contribute to their nation’s economies,” Broin said. The global agricultural marketplace, according to Jim Miller, an economist and the president of Agriculture and Biofuels Policy Consulting, continues to grow (in terms of competing countries) and shrink (in terms of interconnectivity). Biofuels and coproducts like DDGS (distillers dried grains with solubles, a nutritious animal feed) and corn oil have shown great potential for opportunities in overseas markets. In 2016, the United States exported more than 1 billion gallons of fuel ethanol (to 34 different countries), a 26 percent increase over 2015, according to the U.S. Energy Information Administration. That’s almost triple the amount exported in 2010. Corn yields, meanwhile, continue to increase. The 2016 corn harvest featured record-setting totals: 170 bushels per acre and 14.5 billion total bushels. Similar numbers are expected for 2017. 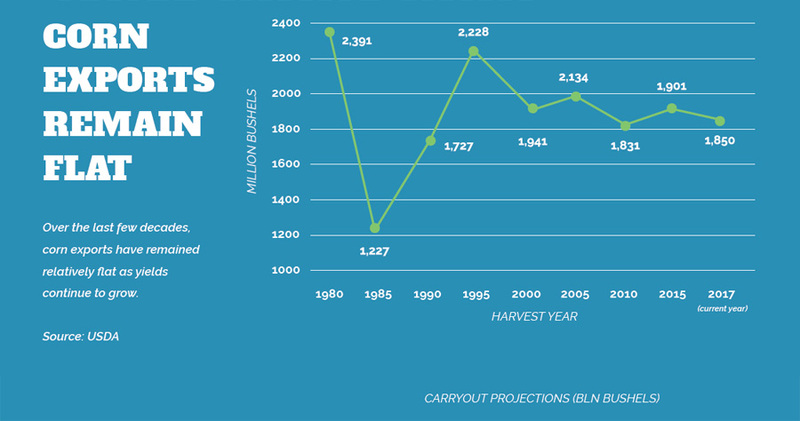 That’s nearly twice the total production from 30 years ago on fewer planted acres. Yet today’s total corn exports — at just under 2 billion bushels — are nearly identical to 1987 numbers. And technology will continue to drive yields even higher: Some experts are predicting nationwide averages of 300-bushel yields within 15 years. One of the policymakers with a history of fighting for biofuels is John Thune, the U.S. Senator from South Dakota. For Thune, backing the biofuel industry needs to begin here at home, with the continued support of the Renewable Fuel Standard (RFS) and an expansion of the Reid Vapor Pressure (RVP) waiver, which currently places limits on E15 sales during summer months. Still, today’s ag industry continues to increasingly rely on an ever-growing international market, a market in which corn from Indiana can quickly make its way to somewhere like India as a product like corn oil. Kip Tom, who has been farming for 44 years, also has three children — the eighth generation of family farmers — working with him. He just hopes people realize how that farm and bioprocessing plant in Middle America and the production of biofuels and coproducts in South Dakota, for example, can affect that ranch in South Korea or that small family farm in Nigeria. 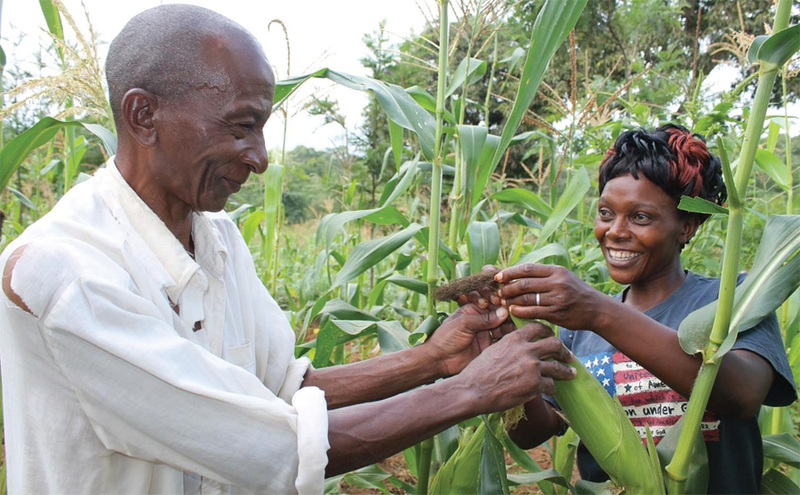 Flooding the international market with subsidized corn would threaten the livelihood of farmers like Christine Ndula, who stands in her field in Makueni County, Kenya, where she anticipates harvesting 10 bags (approximately 35 bushels) of corn. Seeds of Change’s Mission Grow has helped Ndula and many other farmers increase their crop yields. If she planted local varieties, she would have expected to harvest only six bags (21 bushels) from the same plot.